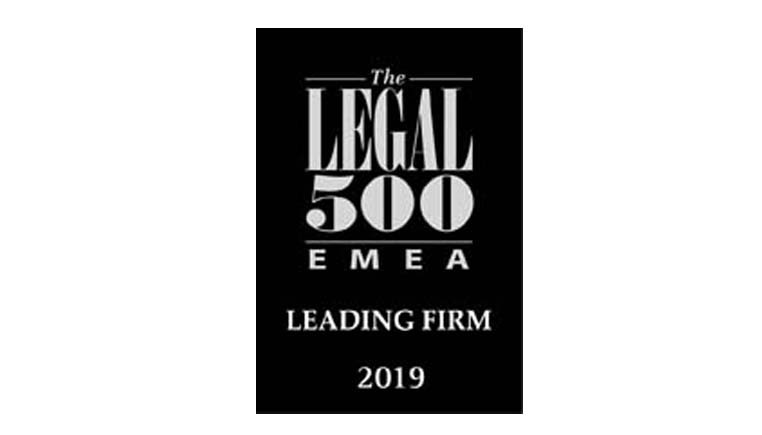 LK Shields have once again been highly ranked in The Legal 500 2019 guide to outstanding lawyers in Europe, Middle East & Africa. Banking and Finance - Practice head Andrew Power, Richard Curran and Neil O’Keeffe are recommended. Capital Markets - David Williams and 'key part of the practice' Trevor Dolan are recommended. Commercial, Corporate and M&A - Gerry Halpenny and Jennifer McGuire are singled out for their 'outstanding reputation and ability'. Emmet Scully and Practice head Richard Curran are also recommended. Construction - Richard Curran is recommended. Dispute Resolution - 'Top Advocate' Michael Kavanagh, 'hardworking, knowledgeable and pleasant' Ciara O’Kennedy, Jennifer Clarke, who is 'direct and straightforward in her approach and brings solutions to her clients' and Amy Bradley are all recommended. EU & Competition - Practice head Marco Hickey, who has 'great understanding of deal dynamics and is not afraid to fight for his client when he needs to' is recommended. Employment - ‘Exceptional’ practice head Aoife Bradley and 'TUPE specialist' Jennifer O'Neill are recommended. Energy and Natural Resources - Practice head Philip Daly, who ‘brings calmness and quiet confidence in an unassuming style and has lots of patience with those less familiar with the nuances of Irish law’ is recommended. Information Technology - Practice head Peter Bolger, Jeanne Kelly, and Associates Jane O’Grady, Aideen Burke and Robert Haniver are recommended. Insolvency and Corporate Restructuring - Jill Callanan and Ruairi Mulrean are recommended. Insurance - Michael Kavanagh, Shane Neville, Ciaran Markey and Ian Lavelle are recommended. Intellectual Property - Practice head Peter Bolger, Ciaran Markey and Jeanne Kelly are recommended. Investment Funds - David Williams and Trevor Dolan are recommended for their 'succinct and focused' advice. Pensions and Employee Benefits - Practice head Aoife Bradley, who is ‘excellent in the areas of corporate and employment law’ and Gillian Dully are recommended. Telecoms - Peter Bolger, Gerry Halpenny and Seanna Mulrean are recommended.